Die-hard sports fans know that tailgating is about more than burgers and beer; it’s the ultimate sporting social event. Marathon owners know that home is where you park it, and tailgating season creates some of the most interesting neighborhoods around. 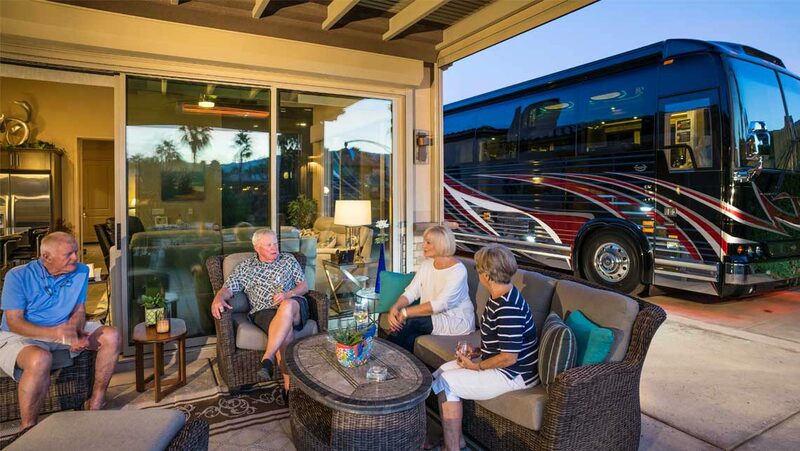 Whether celebrating team pride or reveling in the party atmosphere, enjoy game day in comfort and style before, during and after the big game in a Marathon Coach. One Alabama fan elevated tailgating to an art. His triple slide H3 not only featured the crimson and white university colors, but also sported the words “Crimson Tide” in spectacular red lights across the front of his coach — red under-coach lighting completed the look. Although some of his friends — both old and new — enjoyed watching the game on one of the two televisions in his salon, most chose to congregate outside the coach. Between his entertainment bay with large screen TV and built-in barbeque grill, plus a refrigerator and coolers, this Marathon quickly became a true party bus. of course, a great menu. From the breathtaking waterfront lots at Bluewater Key RV Resort in Key West, Fla., where one can jump directly from the patio area into the water, to the natural wonder of Hearthside Grove in Petoskey, Mich., where visitors enjoy cooking classes with local chefs in a state-of-the-art clubhouse theater, it’s easy to understand why people embrace the luxury RV resort lifestyle and all it has to offer. Across the nation, each of these resorts has its own flavor of opulence. Take the StoneRidge Golf and Recreational Community nestled in Blanchard, Idaho, for instance. Located a stone’s throw from Spokane, Wash., the 650-acre golf and recreational community flawlessly combines sleepy, serene surroundings and an active, vibrant community. With two lakes, 19-hole golf course, six championship pickleball courts, tennis courts and so much more, their state-of-the-art Motor Coach Village is an ideal retreat. If a vibrant city pace is desired, there’s always Las Vegas — known for neon radiance, world-class entertainment and endless choices of casinos, shows and buffets. LVM Resort is a desert oasis complete with gorgeous backdrop and a relaxing atmosphere, all within minutes of the Las Vegas Strip. This luxury resort offers a myriad of amenities, including a 10,000-square-foot clubhouse, resort-style swimming pool, two whirlpools, tanning pool, nine-hole putting course, two lighted professional tennis courts, spa and fitness center and more than 400 perfectly landscaped coach sites. Most coach owners know that when you’re on a grand adventure, every day’s a celebration. However, Premier RV Resort, located in Coburg, Ore., takes this idea seriously, celebrating summer with festivities and food. Tuesday brings 50-cent tacos at the Ducky Diner and an ice cream social in the afternoon. Friday features a Happy Hour with appetizers at the pool deck. Saturday is all about S’mores and Sunday features coffee and donuts. Plus, they host a BBQ every holiday weekend except Labor Day — that’s reserved for the chili cook-off. Yes, our neighbors know how to have a good time. With eyes on the target, world class benchrest shooters Lou and Connie Murdica know all about profound concentration, aim and precision. However, these two award-winning sharp shooters keep their focus on what’s important — their family, friends and those around them. Although both are respected shooters in their own right, many people recognize Lou from the product and event posters he graces at industry affairs such as the Firearms Industry Super Shoot, which is no surprise with a resumé like his. With titles such as “World Record Holder,” “Respected Benchrest Ace,” “Expert Product Tester” and “Sniper King” just to name a few, this Marathon coach owner and his wife often find themselves the center of attention. Last July was Lou’s second time entering the prestigious Sniper King competition and his second time winning the title. Lou, who has been shooting competitively since the 1980s, attended the first ever World Benchrest Championships in Frejus, France in 1991. More than 30 countries participated, including Russia, Japan, Iran, New Zealand, Canada and Africa. “The people on my team were known to be wind shooters,” said Lou. “Until the last day we were not considered a strong team. Then the wind started to blow hard. That last day, the day the wind came, we surpassed everybody. We did it and it was just the chance of a lifetime.” The USA team won the “2 Gun Teams” trophy. Angelina has caused quite a stir in the bench-rest shooting discipline. Because there are no separate divisions for women or children, all entrants shoot in the same competitions. Imagine the surprise of some of the nation’s top shooters and Hall-of-Famers when a 10-year-old girl beat all but three of them, placing fourth in a 100-yard benchrest match in a Phoenix competition. Forrest and Katie Griggs’ Marathon may look like the quintessential luxury RV from the outside, yet it soon becomes apparent that this is a place of magic, a home-away-from-home with a foundation of adventure — ballooning. After relocating from California to Lake Tahoe on the Nevada side, they found that having no jobs meant more free time than ever before. Enter Sushi, the custom-designed, oversized goldfish that is often seen swimming through the sky wherever the Griggs find themselves. With puckered lips and a three-story-tall tail, this hot air balloon is impossible to miss. The couple traveled extensively with the fish-shaped balloon for approximately six years, attending a NASCAR race or visiting Niagara Falls or the Grand Old Opry during off weeks. “We just had a ball,” said Katie. “Our motorhome isn’t just a place to live when we’re traveling. It is a mode of exploration and experience,” explained Alice Nelson. Meet Gary and Alice Nelson. The same sense of adventure that had this fascinating couple following an identical flight plan as Amelia Earhart, as well as spending quality time in Arctic waters, now has them reveling in cross country dry-camping adventures. Because their enthusiasm for adventure and love of cold weather, camping often takes them to more remote areas. In addition to the three 120-volt toekick heaters, the Nelsons have five heaters upstairs, with another five in the underbelly, plumbed into the fuel-fired heating system, thus ensuring their coach will be warm and ready regardless of the conditions. And there’s no need to worry about disturbing their neighbors no matter how close the quarters, how chilly the weather or how early the morning. With a quieter generator and engine, the Nelsons can start their coach, warm it up and get it on the road before dawn without waking the campers around them.